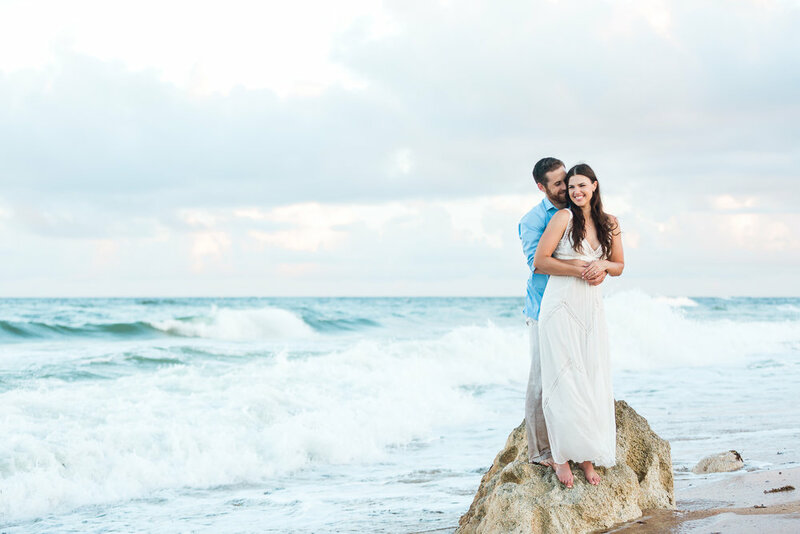 Jami + Tim's engagement session in Washington Oaks Gardens (and beach) was absolutely amazing and so very steamy ;) (Make sure to look at the gallery until the end!) I love that they included their mini australian shepherd Bash as well - he totally enjoyed this entire photoshoot! We actually met on an online dating site. We "matched" and went on a few dates. I initially ended things because I thought I was in a place where I was ready for a relationship, but the truth was I was very happy and put my friends and family first. Months later, after I had officially started my career as a PA and was settling down, I thought to myself, jeez, I really messed up with that Tim guy. He was such a sweet, great guy, what was I thinking ending things? Before I even reached back out to him, I called my mom and we made a plan. GTB which stands for "get Tim back". I reached out to him and he was very open to seeing me again. I don't know for sure what changed, but that first time we spent together since ending things several months earlier, I knew I was going to marry him. I literally told my girlfriends the night after, '"I am going to marry this guy." Fast forward 1 year and 8 months later we are living together in Jacksonville, FL (due to work-hes doing his residency down here) and now engaged. He is my best friend and I couldn't be more in love. I thank god everyday that I gained some sense and realized what I had and that it wasn't too late to get him back. He will tell you, one of the first few times together we went walking around Western Michigan's campus an he knew right then and there he loved me. We got engaged on 9/3/17. His family is die hard Michigan State Spartans. Our family is all back in Michigan. We planned to go back to Michigan for labor day weekend to tailgate before a Michigan state game. Some of our friends were planning on being there and both of our families were. Saturday morning, he took me to campus and we starting walking around. He was taking me down memory lane because he has had so many wonderful memories there. His parents actually got engaged there as well. Anyways eventually he got down on one knee in front of a chapel on campus and he proposed. Soon after our friends and family came running out of the chapel to congratulate us. We then tailgated for the game went to the game and spent the night in E Lansing celebrating. The next day our friends and family had a mini golf tournament and had lunch and then we all went out separate ways but it was a very special weekend. He did an amazing job!